Hello Everyone--Claire here. A huge THANK YOU to everyone that participated in my CAS Christmas challenge this week! WOW--81 entries is just amazing! You certainly made it very difficult to pick winners this week! We were so inspired by all of the fabulous ideas and projects! 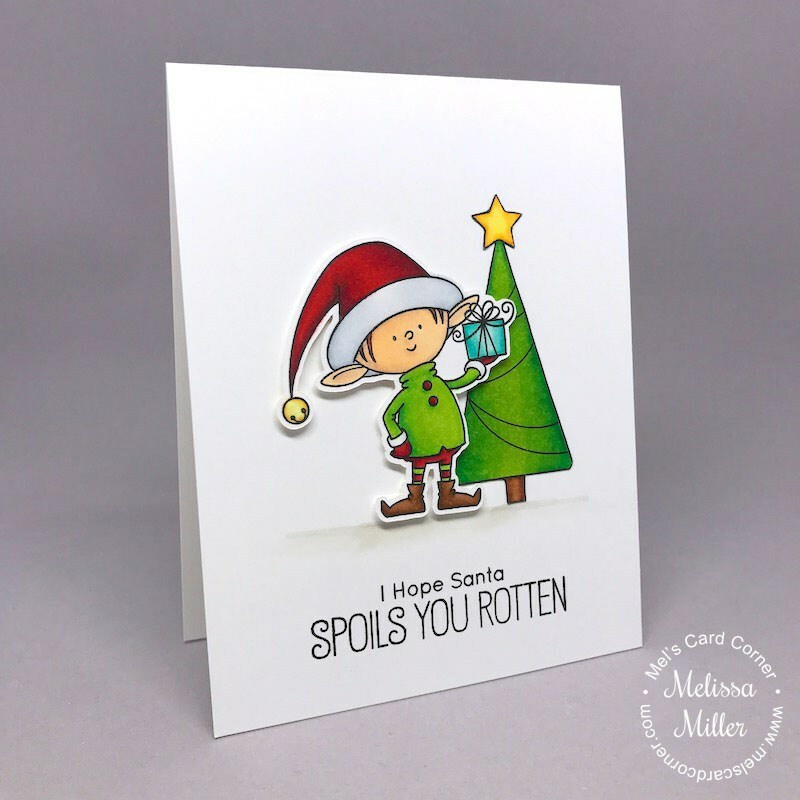 Melissa's card is so FUN! I love this little elf beside his tree! He seems so proud to have a gift to give! Melissa's coloring is amazing and the bright colors pop off the white background. The sentiment made me smile, too! Don't we all hope Santa spoils us? Her card is CAS perfection and just perfect for our challenge this week! Congratulations, Melissa, you are my HEADLINER this week! Thank you again to everyone for playing along with us! Congratulations to all our winners, please pick up your badges here. Be sure to come back tomorrow for a super sketch challenge from Sandy! Thanks Hannelie, for the shout-out! I had so much fun with this challenge - could do CAS Christmas ALL day! Congrats to the other winners too! Thanks for the shout out Joanne, love CAS Christmas! Thank you Jaydee for chosing my card. :) And congrats to all the other winners. Thank you Colleen for choosing my card for one of the "cut above". Congrats to everyone else also and especially to the Headliner, Melissa! Awesome cards! Thanks so much for the shout out, Linda! Congrats to all the winners! Headliner of the week - fells sooo good ! !